It has been a year since Who Are You ended.. Eunbi seems to has gotten a lot prettier since then..
Their chemistry is really no joke.. It feels like seeing Eunbi and Taekwang meeting each other as adults.. He cheered on Sohyun who was an MC that day. Sohyun did the same thing. It's really nice to see this sight..
5. [+12][-0] This might sound random but Hyunsik's eye smile is realy attractiveㅋㅋㅋㅋ I hope Sohyun and Sungjae will rise in the future! 6. 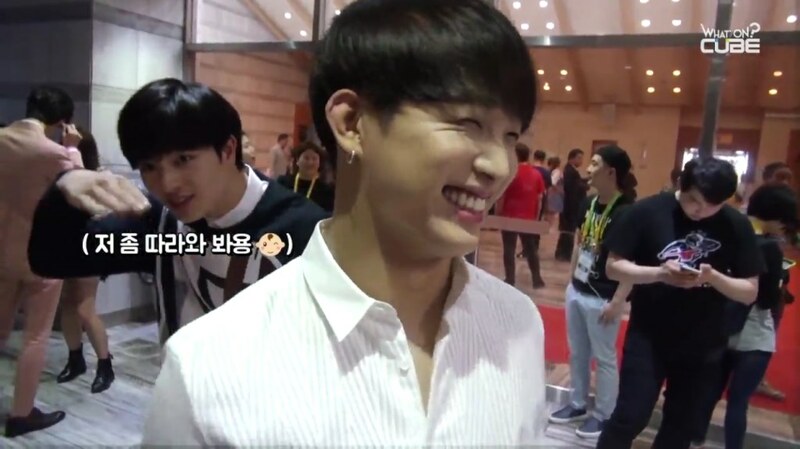 [+12][-0] Look at Hyunsik's eye smile in the first picture..
8. [+9][-0] Whoa.. Yook Sungjae.. Yook Sungjae is really handsome..
9. [+7][-0] Yook Sungjae is so f*cking handsome.. And that person with eye-smile on the first picture is Hyunsik, right?ㅋㅋㅋㅋ Sohyun is a goddess..
10. [+7][-0] Sungjae's eyes really show how much he adores Sohyunㅋㅋㅋ It looks like an Oppa who's being grateful because he has a pretty sister?